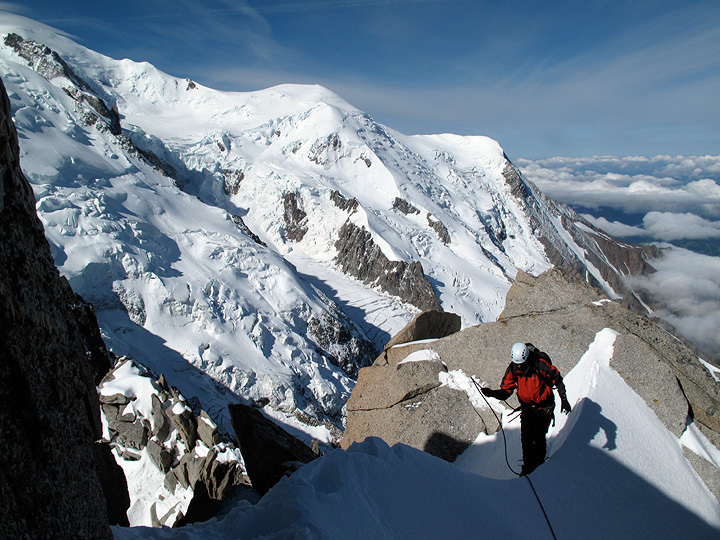 Wim, Ive and Kristof, all friends from Belgium, joined Kathy and Mark for 4 days of climbing in the Mont Blanc Massif. 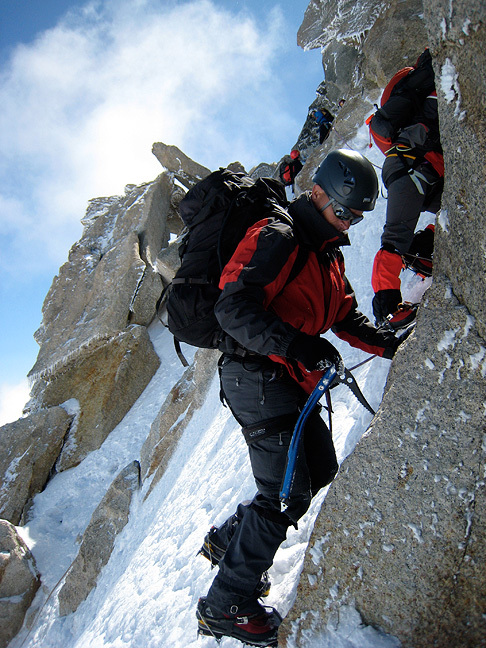 Kristof also did an additional day of crampon training with Mark on the Mer de Glace. Unfortunately, while employing those contortionist moves also know as French-Technique-Cramponing, he hurt his knee. This would loom large in the final days of our program. 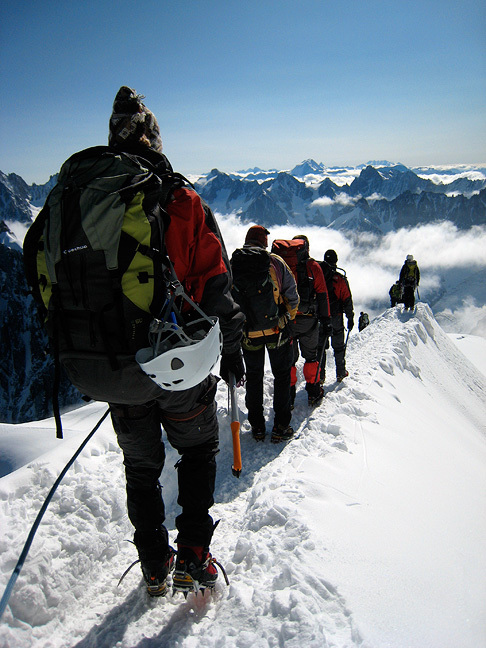 On our first day of mountaineering proper, we all started with an ascent and traverse of the Pointes Lachenal. 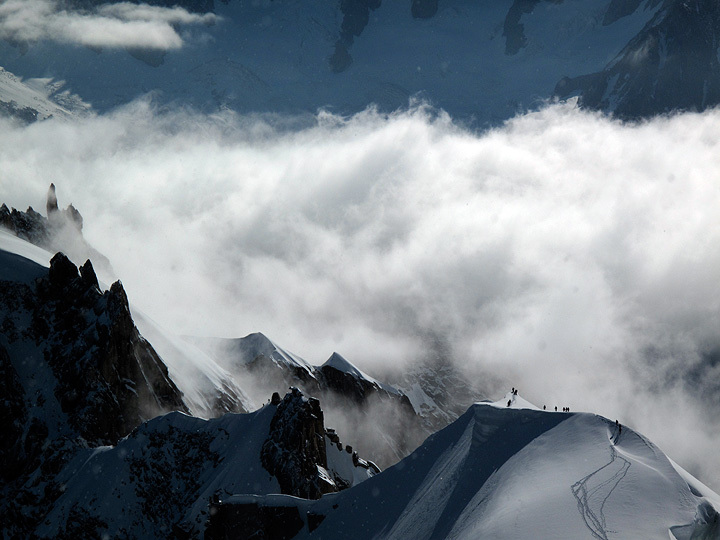 Here, Ive follows the crowd down the sharp arete off the top of the Aiguille du Midi. The views are almost always impressive from here. 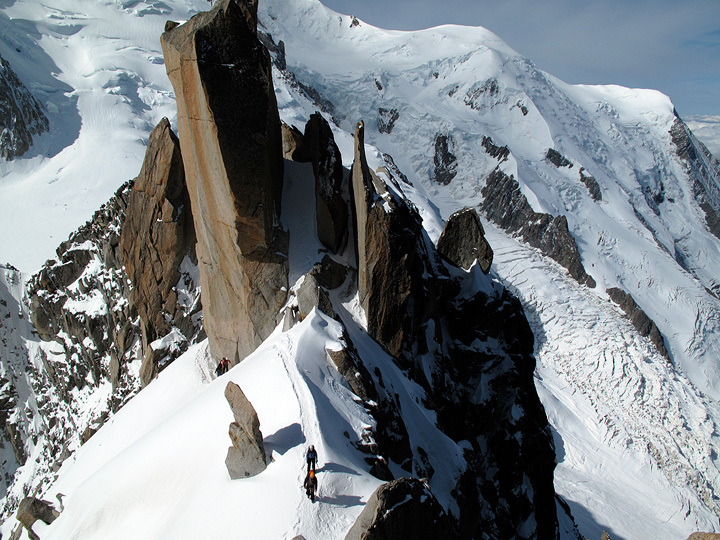 Climbers wandering out towards the Aiguille du Plan. 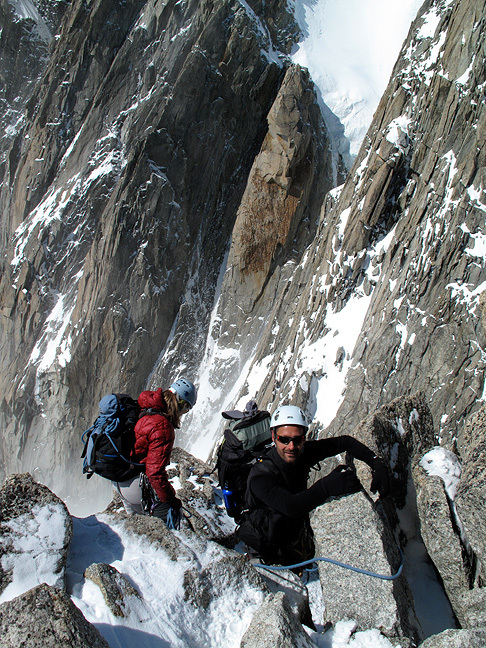 Kathy, climbing with Ive, takes this photo of Wim, Kristof and Mark, with the Dent du Géant behind. Kathy and Ive on the short downclimb off the first summit of the Pointes Lachenal. Kristof front pointing around and exposed corner on the Lachenal. 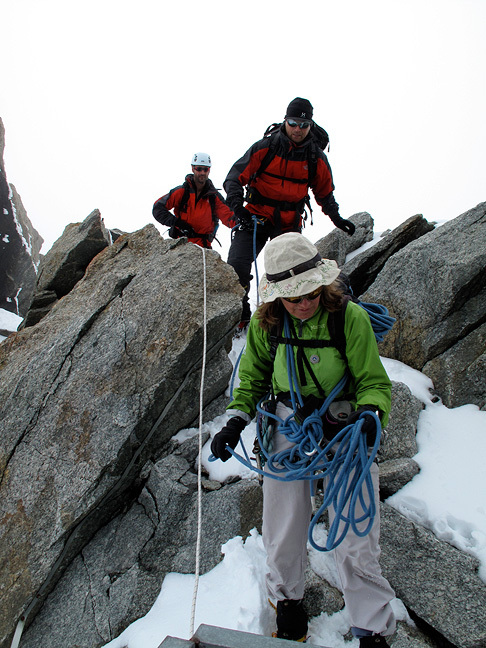 After another long pitch of mixed climbing to the western and highest summit, we descend off the west ridge. Kathy and Ive, heading down. 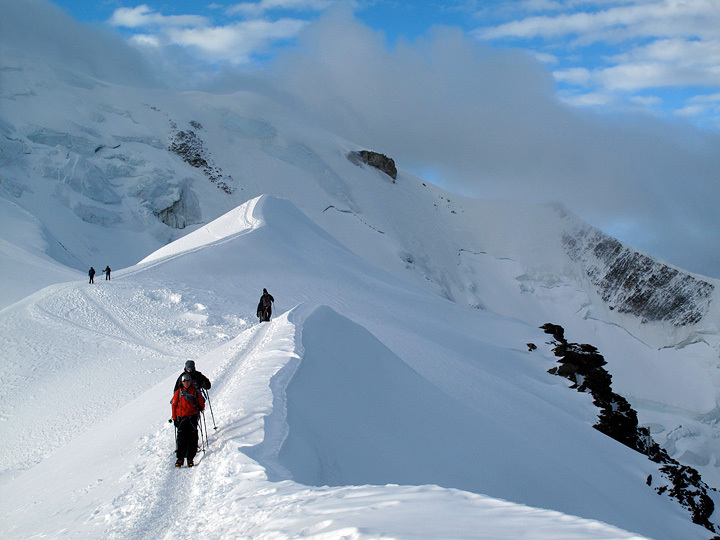 While Mark and Wim hiked directly across the glacier to the Cosmiques hut, Kristof and Ive joined Kathy for the more difficult route, the Arête á Laurence. Mark took this photo of them just as they arrive at the hut. Enjoying a well-earned drink at the Cosmiques hut. After a relatively relaxing night in the Cosmiques hut, the following morning Ive and Mark continued up the Cosmiques Arête, which Kristof (his knee worrying him) and Wim joined Kathy for the technically easier but still rather tiring snow route to the top of the Aiguille du Midi, and the cable-car back to Chamonix. 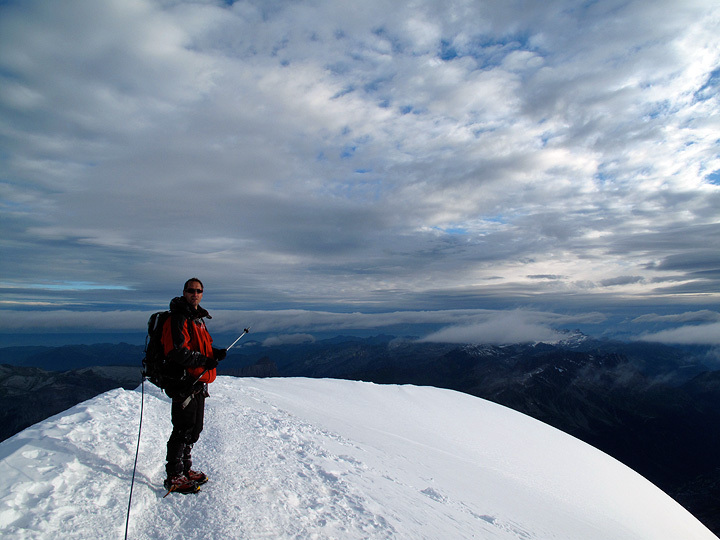 This photo was taken on the Arête. Ive on the Cosmiques, the NW shoulder of Mont Blanc behind. The summit is just out of view to the left. 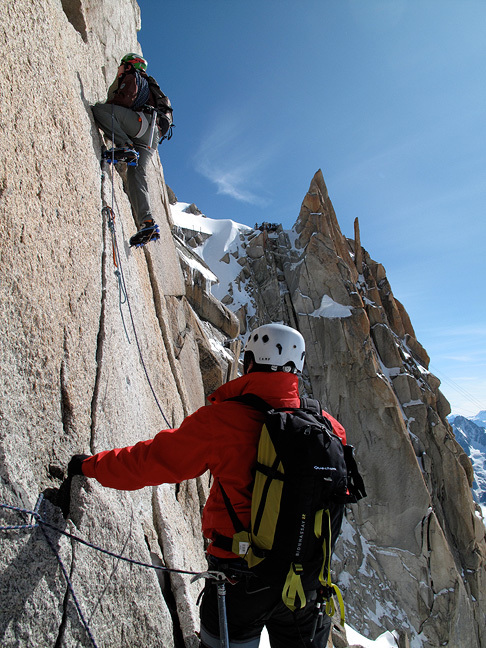 Another party on the "difficult step" on the Cosmiques Arête. On the following two days, Kristof (being of sound mind and a bum knee) decided to give his aching limb a rest while Wim and Ive did battle with the mountains. 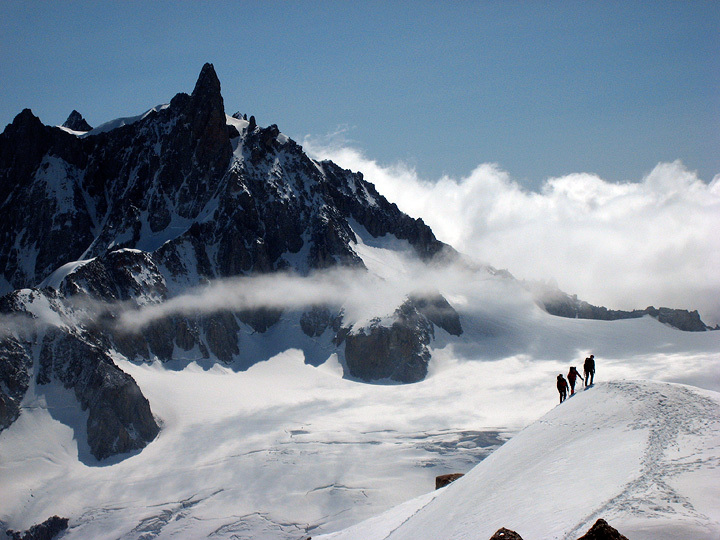 This photo, taken on the last day, shows the Petite Aiguille Verte, which Wim and Kathy climbed. 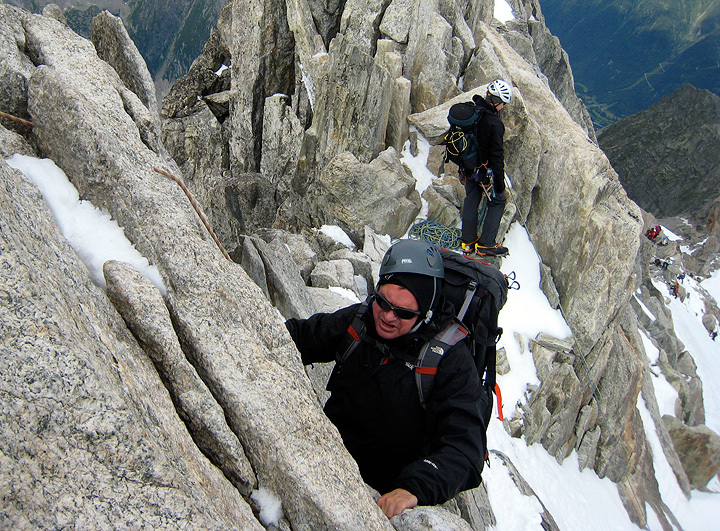 Wim tackles a rocky step on the Petite Aiguille Verte. 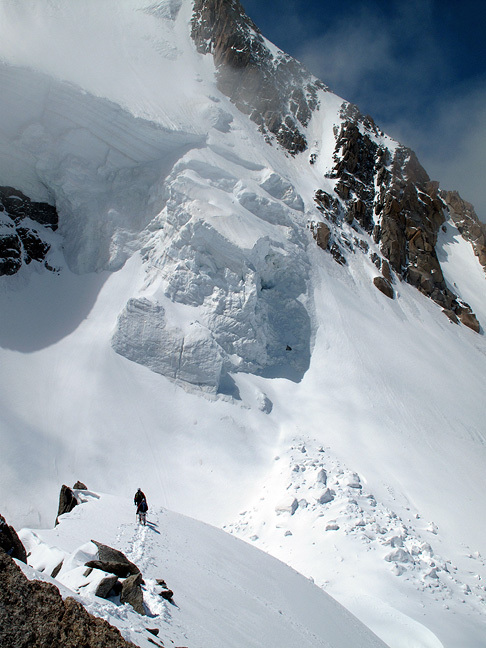 Meanwhile, Ive and Mark climbed Mont Blanc. 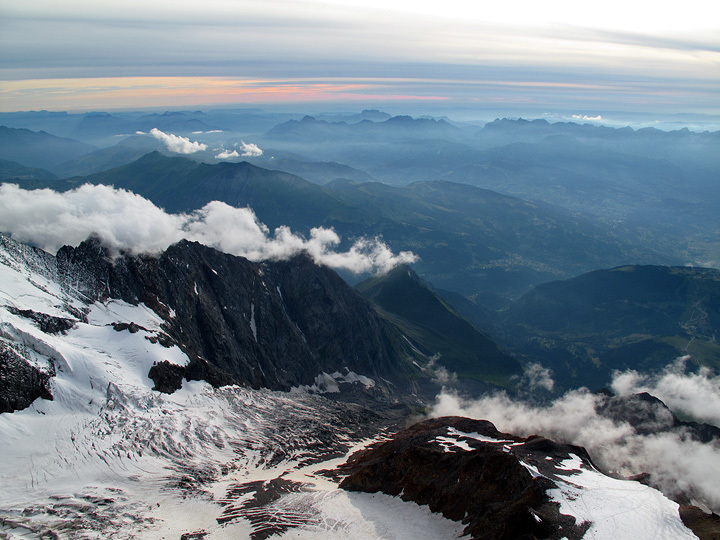 This is sunset from the Gouter hut at 3800 meters. 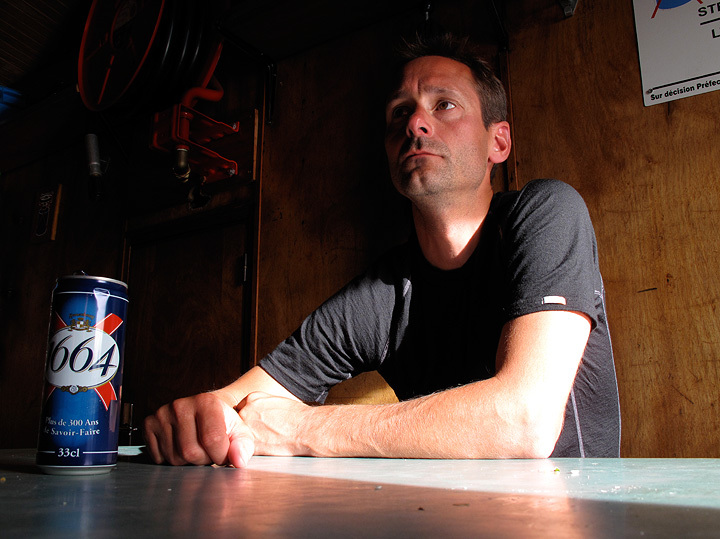 Ive seriously anticipates his next sip of 1664 in the Gouter hut. Rising at 2 am, Ive and Mark set off for the summit of Mont Blanc. 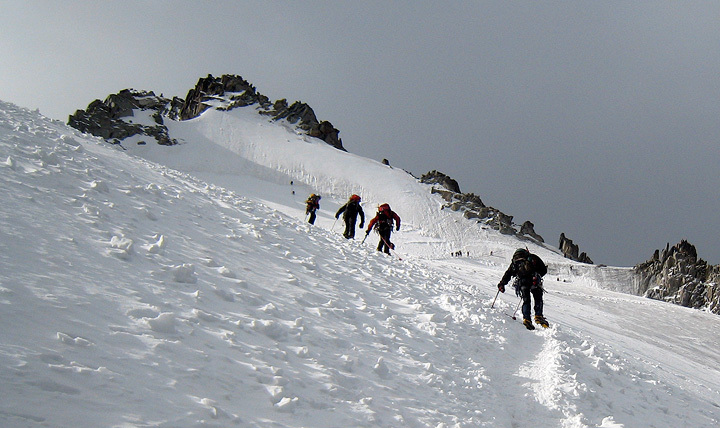 We had relatively clear weather for the first half of the climb, but cloud and snow came in as we approached the top. 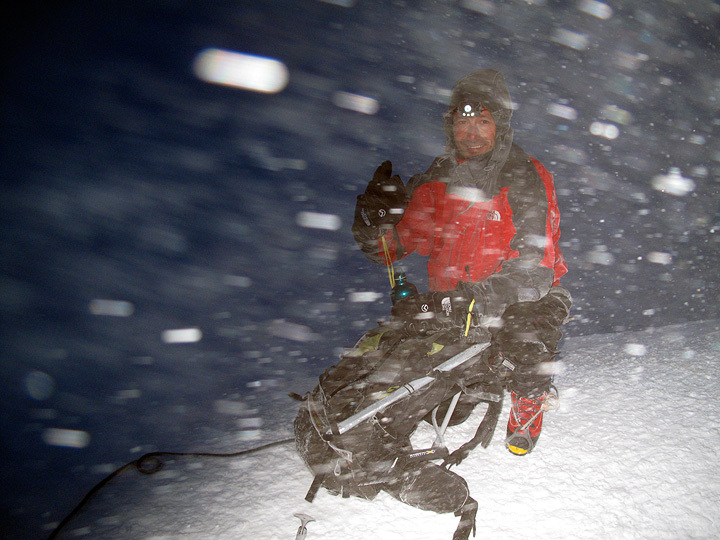 This photo, taken on the actual summit, shows a bit of the nasty weather. Fortunately, we were so fast, arriving on top while it was still quite dark, that we were not out long in the poor conditions. Almost back to the Gouter hut, looking back towards the top, still in cloud. Ive glances back towards Mont Blanc, from just above the hut.